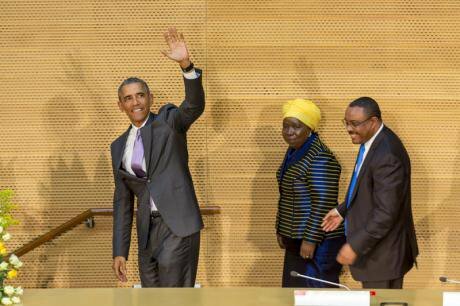 President Obama makes his first presidential visit to African Union,in Addis Ababa, Ethiopia, July 2015. Demoted/ Gazstegnaw Zega. All rights reserved.The first question a person asks you when in Addis Ababa these days is: do you have any information about the famine? Do you think the authorities are hiding the reality from us? Once more, millions of Ethiopians are facing an acute food shortage. Once more, foreign donors are called upon for a dramatic and urgent increase of relief aid. Does it mean that the same age old malediction is repeating itself, again and again, with the same deathly tribute? According to the last Humanitarian Requirements Document (HRD) for 2016, issued December 11 jointly by the government and the donors, 10.2 million people will be in need of food emergency assistance at the beginning of next year, and more than 2.1 million of special nutritional programmes, including 400,000 severely malnourished children. The requested budget amounts to 1.4 billion US dollars. This statement puts an end to the divergences between the Ethiopian authorities and the donor community regarding the figures of people in need. Getachew Reda, the new government spokesman, contested the evaluations made by the former: “It is we who know the exact number of people on the ground who need emergency food aid. It is very unfortunate that we never agree with our partners on the figures. They believe they have to call a huge number to mobilize more aid” . The statement also demonstrates the extreme seriousness of the food crisis and its swift escalation. The number of people in need climbed from 2.9 million (March 6) to 4.5 million (August 18) and suddenly to 8.2 million (September 21). But these figures and their sudden rise must be clarified. For years, around 8 million people have been benefiting from a long-term safety-net programme. It provides them with cash or food for work during the first six months of the year. It will restart in January 2016. The people in need of urgent assistance, therefore, will really have climbed from 2.9 + 8 = 10.9 million in March 2015 to 8 + 10.2 + 2.1 = 20.3 million in January 2016, almost doubling. In Ethiopia, around 90% of the cereal production is harvested in autumn, after the summer long rains season. The remaining 10% is harvested at the termination of spring after the end of the short rains season. But this last output is decisive in a little bit more than 10% of the districts where it represents more than half of the whole year production. They are the most hit by the drought. The lack of spring rains in the eastern and southern lowland pastoralist areas and in parts of the highlands could obviously be seen immediately after the end of spring. But despite being very densely and deeply rooted, the local state apparatus was unable to properly report the imminence of the food shortages. As usual, local officials were afraid of being criticized for having failed to reach their assigned development targets, which is the main criteria for their career advancement. As usual, local officials were afraid of being criticized for having failed to reach their assigned development targets, which is the main criteria for their career advancement. As usual too, the magnitude of the crisis started to be grasped only after assessment teams of mixed Ethiopian and foreign experts came back from the field in July. The new figures about the people in need were released mid-August. Could this delay have been curtailed, as some critics underline it? Probably a little bit. But in any case the delay was shorter than in previous similar crises. A common argument to explain the shortening of the delay is that a strong media alert forced the authorities to react quicker. But the first reports of the national and international press, and the August figures’ release were almost simultaneous. In any case, the immediate reaction of the authorities remained confused and contradictory, and above all too optimistic and short sighted. Clearly, part of the leadership minimized the impact of the drought. Critics argued that it didn’t want to tarnish the image of a country even more so when on the eve of the congress of the ruling party. The regime is claiming very proudly a paraded annual “double digit growth” of the economy for more than a decade, and that Ethiopia has become self-sufficient, with regard to its food supplies on a national level or, at least - self sufficiency is within easy reach. One leading Ethiopian weekly newspaper took this attitude forgranted on the part of “rank and file” authorities. It wrote that there is among them “a deep fear that giving focus to the drought will spoil the hard earned "Ethiopia is growing" narrative… Politics seems to have taken the upper hand in this response”. The divergences between the Ethiopian Authorities and the donor community first concerned the magnitude of the crisis. Indeed, on the one hand, Redwan Hussein, Minister of Government Communication Office, started by saying that “insufficient rain has shown” no more than “some inconvenience”. Later on, Deputy Prime Minister Demeke Mekonnen somehow confirmed that stance by stating that “no one [had] died… due to the lack of food in the affected areas”. However, the USAID-funded warning system FEWS-NET disclosed the following day that some areas were in an “Emergency” phase, as defined by the following criteria: out of 10.000 people, 1 to 2 adults and 2 to 4 children are dying each day due to nutritional deficit. But the main vacillating positions concerned foreign aid. The credo was: the country has its own capacity to deal with the crisis; the government has enough food stock. Redwan Hussein was categorical: “We are able to feed ourselves”. The Prime Minister and Chairman of the ruling party, Haile Mariam Dessalegn, repeated such statements word by word. This provoked strong reactions. “Enough is enough… It is embarrassing and humiliating indeed to observe our smartly dressed leaders scuttling from one donor meeting into another with their begging bowls… It surely should not be beyond Ethiopia’s capacity to handle minor droughts without the necessity for the degrading foreign aid… By running to the UN for help, the EPRDF – the ruling party - has gravely injured the positive image of the country”. This represents around 3% of the whole budget, and 9% of the investment budget. Haile Mariam Dessalegn travelled to the affected areas in the Somali region at the end of October, and almost all regional high officials also did this. The concerned state departments are fully mobilized, including and even more in the regions. When the head of the United Nations Office for the Coordination of Humanitarian Affairs (OCHA) in Ethiopia said that “the leadership and commitment of the government in driving its response to the impact of the El-Nino phenomenon on food security in affected areas has been exceptional", this statement is not only diplomatically motivated. When Addis Standard writes: “The trend of not admitting on time to a looming drought hasn't improved over the last four decades since 1974” - the weekly is wrong. In the case of drought, they inevitably fall in debt. If a land market existed, their only choice would be to sell their last asset, their land, with very few possibilities of being employed either locally or in the urban areas, because the available workforce outnumbers the needs. They would simply join the growing rural lumpen proletariat - who is precisely the main food aid seeker. UN, Ethiopia: Government and humanitarian partners launch the Humanitarian Requirements Document (HDR) for 2016, December 11, 2015, Addis Ababa. Reporter, The Gv’t pledges strict measures on ill-disciplined officials, November 21, 2015. Addis Fortune, Ethiopia: Playing Politics With Drought, Dangerous, November 9, 2015. Walta, Government ready to overcome El Nino weather challenges, August 13, 2015, and Associated Press, Cattle dying as seasonal rains fail in parts of Ethiopia, August 11, 2015. APA, Ethiopia: Govt denies death from hunger, November 13, 2015. Horn Affairs, Afar, Somali areas reached "Emergency" – fourth worst stage of food insecurity, November 14, 2015. For example, Horn Affairs, Ethiopia: Delayed rains causing "crisis" in Afar, Somali regions, August 15, 2015. The Reporter, Ethiopia: Gov’t dismiss the need for food aid, August 15, 2015. Addis Fortune, Ethiopia: Drought - Not Just Nature but Governance, October 28, 2015. Ethiopian News Agency, Int’l Community not Meeting Anticipated Assistance to victims of El Nino in Ethiopia: GoCAO, September 22, 2015. Tigray On Line, EPRDF’s persistent failure to handle minor droughts independently, October 14, 2015. BBC aired on November 7 a very strange programme about the drought and the food crisis. It started with a mother crying over the death of one of his children. It was obvious from the context that the child died from starvation. But a text accompanying the programme stated he was sick. Then the whole family was filmed, and its children appeared normally healthy. The commentary stated that in one adjacent area “two babies were dying every day”, but not one image showed even skeletal cattle, let alone emaciated children. Addis Fortune, Playing Politics with drought, dangerous, November 9, 2015. IRIN, Ready or not - drought tests Ethiopia?, 27 November 2015. Walta, Partners pledge to scale up contribution to address drought effects, December 11, 2015. OCHA statement, October 10, 2015, Addis Ababa. Addis Standard, Ethiopia should depoliticise hunger, October 13, 2015. As a VOA radio programme in Amharic seems to confirm. World Bank, Ethiopia’s Great Run : the Growth Acceleration and How to Pace It, November 24, 2015. National Planning Commission, The Second Growth and Transformation Plan (GTP II) (2015/16-2019/20) (Draft), September 2015.